With Stephen gone for an entire week in Miami attending the Hispanicize conference (I’m not bitter), I found myself eating crap. Without my other half to eat with/cook for/to cook for me, I found myself at three fast food joints in a single day, ordering the same dull burger and fries…in the drive thru of course, and wearing my pajamas. Stephen shared a few photos of the food he was eating, nay, experiencing in Miami. And here I was making myself sick, literally, from eating (bad) fast food. No mas. After I peeled off my stale pajamas and washed away the fast food funk I was in, I made myself some huevos rancheros. I cook them the way one would make Portuguese or Spanish Baked Eggs or Company Eggs. But since it’s just me for breakfast, I made it all in one skillet on the stove. My ranchero sauce is still full of diced tomatoes, onions, peppers and serrano chilies, but I kept it chunky. The tomatoes do cook down, and if you want a thinner sauce, feel free to puree half or all of the tomatoes. The thinner sauces remind me of salsa. What I made for my breakfast is similar to a spicy tomato chutney, which I then use as a bed for the runny eggs. If that sounds appealing to you then read on for the recipe. 1. In a large skillet (14”-16”) begin heating 4 tablespoons of oil over medium heat. Add the garlic, serrano peppers and onions. Mix to coat evenly. Allow to cook for 2 minutes, making sure the garlic does not brown. 2. Add the bell peppers. Mix to coat evenly. Allow to cook for 3 minutes. 3. Carefully add the tomatoes and their juices. Season the tomato mixture with salt, pepper, and oregano. Mix all the ingredients together. Allow to cook for 5 minutes covered. 4. Begin heating your beans in a separate pan. 5. Also begin cooking the tortillas. First coat them lightly with vegetable oil. In another skillet, or comal, begin heating them. You don’t want hard tostadas, just heat them long enough to cook through and give them some color, about a minute on each side. Keep warm until ready to use. 6. Using a spoon or spatula, make small indentation in the ranchero sauce, and carefully crack an egg into the shallow well. Repeat until all 8 eggs have been nestled into the sauce. Cover and cook for 5 minutes, or until the eggs whites are set but the yolk remains runny. Remove from heat. 7. To serve, smear the warm and slightly crispy tortillas with the warm beans. Scoop out one egg per tortilla, and carefully place on top. Two eggs per serving. Make sure you get some of the spicy tomato ranchero sauce. Serve with salsa, avocado slices, or enjoy as is. A quick note on cooking vessels: If you do not have a 14”-16” skillet, you can use two smaller skillets with your ingredients divided. 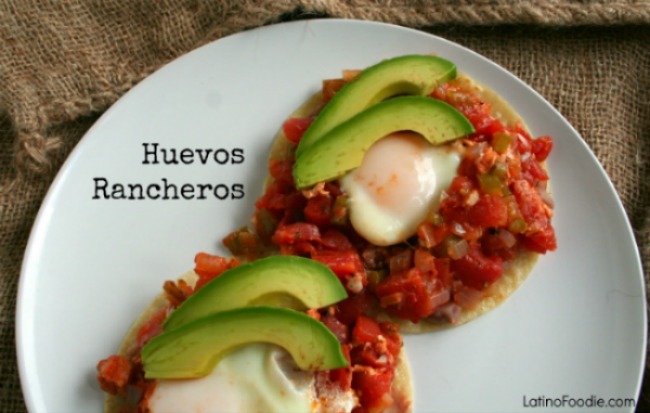 Or you can bake your huevos rancheros. Simply place all your spicy tomato ranchero sauce in a large casserole dish and crack the eggs directly into that. Bake at 350°F for about 7-10 minutes or until the egg whites have set.